Pasta Recipe with Chicken Bacon - Pasta loving people who love to eat veggie pasta they are going to taste with chicken bacon too. So try this dish at your home and don't forget to leave your comment about how the taste was. 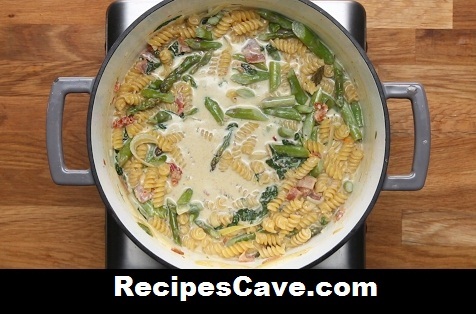 Here is what you'll need to cook Pasta Recipe with Chicken Bacon for Servings: 4-6 peoples. 1. In a large pot, crisp the bacon on medium heat. Drain excess grease so there’s about 3 tablespoons left in the pot. Add in the chicken, season with half of the seasoned salt and pepper, and cook. 2. Once the chicken is nicely browned, remove it from the pan but leave the bacon. 3. Add in the onion and asparagus. Stir until the onions begin to become translucent, then add the garlic and spinach. Stir until spinach is wilted, then add sun-dried tomatoes and season with remaining salt and pepper. 4. Pour milk over veggie and bacon mixture, and bring to a boil. Stir periodically so the bottom does not burn. 5. Once milk is bubbling, add pasta and stir frequently until pasta reaches your desired doneness (approximately 10 minutes at medium heat). 6. Stir in parmesan cheese and mix until cheese is melted. your Pasta Recipe with Chicken Bacon is ready to taste.